Have you ever, as an ever tough punk rocker wanted to let you inner-emo out? But how could you and still save face with all your extra tough punk rock friends? 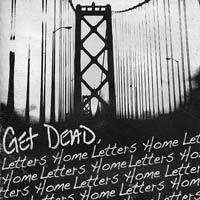 San Francisco’s Get Dead holds the answers to your fears. Their “punkcoustic” anthems reek with their innermost feelings but still come across as cool and nonchalant. I venture to say that you can safely listen to Letters Home and you will still command the respect of your spike-bedazzled friends and maybe you’ll even show that cute little pale girl all dressed in black a little bit of your own tortured soul (but not too much) Aside all that, Get Dead brings some fine non-electrical punk rock in an anthemic and almost piratical way. If I had to make up some adjectives that you can use to tell your friends about them, I’d go so far as to say that they are both Clashtastic and SwinginUtteriffic. For those of you back east, you can say that they’re wicked sweet!